Composed by Joe Carr. Saddle-stitched, Style, Tunebook. School Of. Bluegrass. Book/CD set. 32 pages. Mel Bay Publications, Inc #21740BCD. Published by Mel Bay Publications, Inc (MB.21740BCD). ISBN 9780786679447. 8.75 x 11.75 inches. 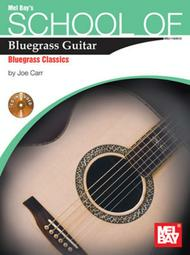 This book helps guitarists who are currently stuck playing simple melodies develop fiddle-tune-like solos to bluegrass songs and tunes. Thirteen songs are presented in both a simple Carter-style melody-based arrangement followed by a more fleshed out fiddle-style arrangement. Using the licks and concepts presented here, guitarists can develop their own unique solos to popular songs. Angeline the Baker is presented in a special four-part arrangement that details how to take a simple quarter-note-type melody and develop it into a full eighth-note-based flatpicking solo.